*APR is Annual Percentage Rate. Rate is dependent on credit qualifications. Cardholders will earn a 1% reward for every $1 in net purchases (purchases minus returns/credits) made on their Members First Credit Union Visa Platinum Rewards Card, rounded to the nearest one cent ($.01). The following purchases/transactions do not earn cash rewards: cash advances, balance transfers and account fees. All MFCU credit cards are subject to credit qualification. Already have a VISA Rewards Card with Members First? Submit Your Balance Transfer Request Today! If you are just starting to build your credit or are on a mission to re-build your credit, we want to help! With a Share Secured VISA Credit Card, you borrow against the balance in your Share Savings. 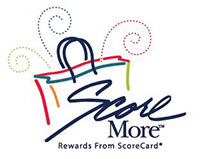 Plus, you'll receive points for each purchase with the ScoreCard Rewards Program.